Whenever liquid media circulate from and into a storage tank in the circuit, for example the cooling lubricant of a machine tool or when liquids are conveyed from a tank or delivered into a tank, the filling height in the tank is a relevant control variable. This can be designed as a simple on/off control of the pump using a float switch or an optoelectronic level switch. Frequently, a continuously measuring submersible pressure sensor (hydrostatic pressure of the liquid column in the tank) is also used to operate an energy-efficient speed-controlled pump. For all installations, the customer requires a “fit and forget” solution. The plant must function 100 % reliably, resistant against the widest variety of media and insensitive to solids. Of course this also applies to float switches and submersible pressure sensors. 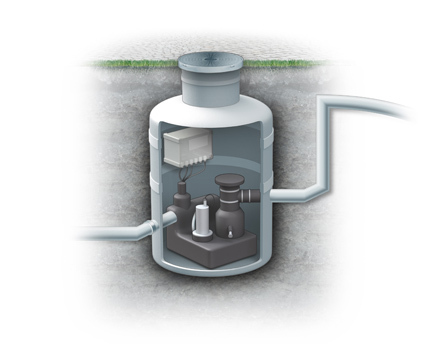 The pictured example of a sewage lifting system shows the challenging task of maintenance-free level measurement with an extremely solids-laden medium. Here WIKA, in close cooperation with our customers, has developed a solution with unique reliability.